The best way to enjoy Friggitelli peppers is to deep fry them and enjoy them as an antipasto or a side dish - their name actually derives from the verb "friggere", to fry. Wash the Friggitelli leaving them whole, stem included, then dry and prick them with a fork. Heat the oil with the 3 cloves of garlic - be careful as it the oil will start spitting once hot. Fry the Friggitelli until they change colour and darken. Dry them well with kitchen paper and add salt to taste. 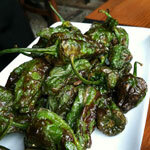 You can enjoy them warm or at room temperature, eating them whole except for the stem. 180g caster sugarPreheat the oven to 160 C.
Wash the cherries and remove the stone. Mix the butter with the sugar with a whisk until you have a smooth cream, then add the eggs, yoghurt and salt, mixing until all the ingredients are blended together. Now slowly sieve in the flour and the baking powder. Line and grease a cake tin. Cover the base of the cake tin with half of the pitted cherries and pour the cake mixture over them. Then, add the remaining cherries on top. Cook the cake for about 1 hour until a skewer comes out clean. 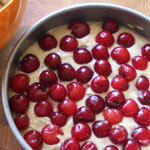 Once ready, leave you cherry cake to cool in the tin. Serve with whipped cream and cherries. 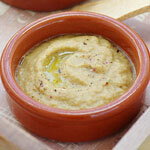 The perfect summer dip - particularly delicious enjoyed in the sunshine! Put the aubergines on a baking sheet and roast until tender (it will take about 30 minutes) then let them cool and peel them. While the aubergines are cooling chop the shallots, fresh garlic and parsley. Put them in a food processor along with the aubergine flesh and the olive oil. Spoon the mixture into a bowl and add the yoghurt and the seasoning. You can enjoy the dip with simply plain cafone or with some cafone bruschettas. To make the bruschettas, simply roast some cafone slices, rub them with some fresh garlic and top them with extra virgin olive oil, salt and pepper. Choose 4 beautiful glasses to house your verrines. Wash the apricots. Boil for 3 minutes, and leave to cool until you are able to handle them. Then halve and stone them, setting aside half an apricot for each of your glasses and a 2 more, cut into strips. With the rest, blend them until smooth and add the sugar. Whip the cream and add to the pureed apricots. 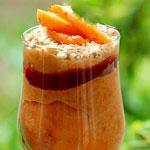 Place the saved apricot halves in the glasses, then spoon over half the apricot puree. Add a spoon of cherry jam in each and sprinkle some flaked almonds on top. Then fill the glass with the rest of the apricot puree. Decorate with a few flaked almonds and the fresh apricot strips. I love how you can plan your menu for the week. I sit all day thinking about what I'm going to make for dnneir and sometimes end up with just a pizza to stick in the oven!Following you here from the Mingle Monday Blog Hop.Please come visit us at and find out what everyone's saying, doing, etc. There, you'll also meet a really great group of wonderful women who love to connect and meet new people. Hope you had a great Mother's Day! Have a lovely week! Take Care,Lexie Lanewww.voiceboks.comP.S. Please come and join our year long Hop with when you have a chance!